Lauren Faust has blown our minds with her work on Powerpuff Girls and My Little Pony: Friendship is Magic. 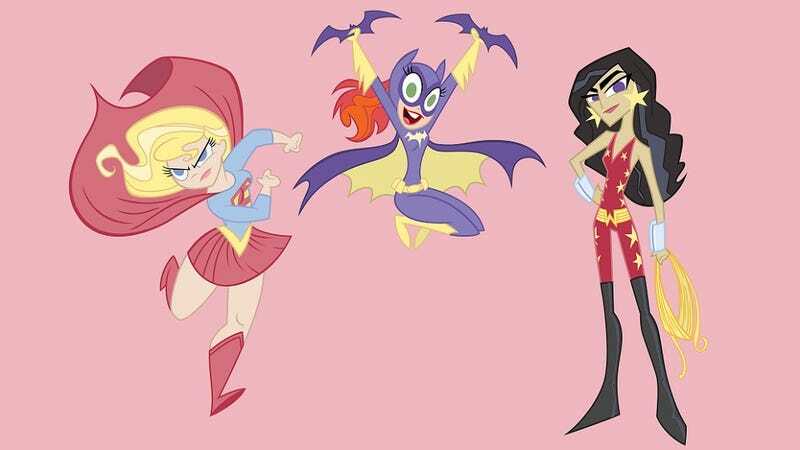 And now she's tackling the DC Universe with a new series of shorts, called Super Best Friends Forever, in which Batgirl, Supergirl and Wondergirl hang out and fight supervillains. We were lucky enough to talk one-on-one with Faust, and she explained how these shorts will fulfill some of her original ambitions for My Little Pony. So first, the basic facts — Super Best Friends Forever is airing as part of the "DC Nation" block of programming on Cartoon Network, which premieres March 3. (Along with those Aardman Animations DC shorts, a hilarious set of Teen Titans shorts, and tons more.) According to Faust, there are five episodes of SBFF, and they're each only a minute and 15 seconds long — just long enough for to set up and resolve one really good joke. Faust tells us she heard that Warner Bros. Television and the Cartoon Network were accepting pitches for DC Nation shorts, so "I just got really excited" and pitched some ideas, which wound up getting accepted. "What I really love about this program with Warner Bros. and DC is that they're really letting the creators of these shorts take liberties, and really have fun and play with these characters." As for where the concept came from originally, she says she was inspired by the fan art of superstar artist Brianne Drouhard, who's also working on some DC Nation stuff, including Amethyst, Princess of Gemworld (see video) and Teen Titans. Faust loved the way Drouhard depicted an energetic Batgirl, who's "excited and looking like she's having a lot of fun." She had a lot of conversations with Drouhard as she developed this concept. Meanwhile, Batgirl is sort of the ultimate fangirl — Barbara Gordon grew up watching her dad work with Batman, since she was a little girl, and she's looked up to him as a hero. "She's a geek," says Faust. "She's dreamed about being a superhero throughout her whole childhood, and now that she's a teenager and she's got this mantle, she's finally getting her chance." So all three girls are eager to be heroes and to prove what they can do. Faust came up with a lot of backstory for all three characters, although it may not really be featured that much in the shorts. And unlike some other depictions of superpowered teens, Faust sees these characters as real friends who "are supportive." There will be three supervillains featured in the series, but the focus will really be on the three girls who are friends with each other and their relationship, and how much fun they have being superheroes. Often when you see young girls depicted on television, they're more competitive — but here, the emphasis really is on these girls being B.F.Fs. When Faust was creating My Little Pony, she originally wanted it to have more of an adventure-based tone — and she's excited to be able to feature more of that tone here. "You get to have fighting in a superhero show," she notes. "There's absolutely no fighting in My Little Pony." She wasn't really upset or disappointed that the action-adventure aspects were downplayed in MLP — it's more like, the project evolved as she collaborated on it — she's glad to be doing more of that here. SBFF will feature "a little more adventure, a little more action, higher stakes [and] higher emotions... but still the same humor and the same heart." Faust doesn't necessarily expect these ultra-short episodes to lead to anything longer — the purpose of the DC Nation bloc is just to show a bunch of fun shorts, and experiment with one-shot projects — but she wouldn't mind expanding it. "If people should like it, and if people should respond well to the shorts, never say never. I could certainly see it in my head as something to carry longer stories and definitely a cool series. But that depends on a lot of other factors." It's funny, I've seen a lot of conversation and debate as to why that is... It seemed like a while back people were testing the waters, to see how people would respond. I'm not sure what happened. I think people are less open to it now. But who knows what'll happen in the years to come? Hopefully something will break through and get the amount of attention that'll give people the courage to bring that kind of stuff again and get it bought. It's a goal of mine, because I don't think there's enough out there for girls, and when things are aimed towards girls... a lot of it just turns into poor quality stuff, and I think it's people being a little too precious about what's appropriate for girls or being a little short-sighted about what girl's interests are. I want to change that, and I want there to be stuff for girls on TV and in the movies that they like and that they're proud to like, and that they don't stop watching by the time they turn seven. So I would like to continue on that path. It's my goal, it's always been my dream. I think I might have put a little bit of a dent in the perception of what girls' entertainment is. I'd like to keep it going, and I hope that other women in animation and in comics can take up the mantle and start getting a little bit of movement — and start getting a little bit of faith from the people in charge.